New York was burning, smoldering. 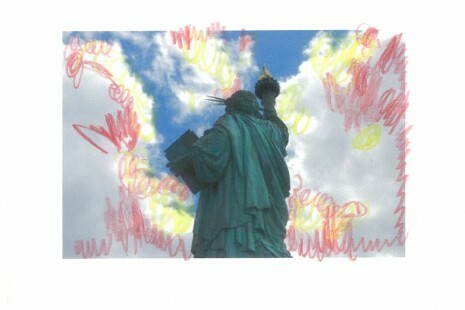 I remember flying over and circling above the Statue of Liberty, looking down on it. I could read the book in her left hand. Instead of the numerals on the real statue, the word “union” was inscribed on the tablet. Editor’s Note: To date, the 9/11 Citizens’ Grand Juries are models. However, communities in the U.S. and in the 82 nations, which lost citizens on 9/11, can establish their own Town Hall meetings and elect their own Citizens’ Grand Juries. PDJ also encourages readers to listen to their dreams and consider the legal remedies they might reveal. PDJ encourages readers to listen to their dreams and consider their guidance about using your special gifts to create a more peaceful world. Let us know; we support viable peace efforts. Lynn, life change consultant and producer of transformational entertainment events including Live Aid, Hands Across America, and the Bicentennial Celebration of the U.S. Constitution, moved to Los Angeles. There, in the aftermath of 9/11, she co-founded Los Angeles 9/11 Truth and guided it to prominence in the global 9/11 grassroots movement. A cornerstone was Lynn’s resurrecting the constitutionally guaranteed People’s Grand Jury and applying it to redress the U.S. government’s involvement in the crimes of 9/11. Without realizing the political significance of her dream, Lynn initiated action, this time toward preserving a union, this time, the union of the United States of America. As evidence mounted of government complicity in 9/11 and a government/media cover up with no justice for the perpetrators, Lynn and 911TruthLA.us, convened a “Citizens’ Grand Jury on the Crimes of 9/11” in 2004 and 2005. “It is necessary to reestablish the citizens’ grand jury if the great American experiment is to survive,” Lynn believes. In June 2008, after learning how dreams fueled the activism of 9/11 family member Ellen Mariani and peace activist Cindy Sheehan, Lynn considered the smoldering New York union dream in another way. One of the most famous icons in the world, the statue rising from the New York Harbor testifies to freedom from tyrannical governments. In theory, the grand jury is a body of independent citizens with the power to investigate any crime or government misdeed brought to its attention. The Grand Jury can make its own presentment — a formal statement of the grand jury’s independent assumptions, fact-findings, and conclusions. Lynn’s Statue of Liberty dream with the word “union” inscribed on the icon’s tablet embodies not only the historic founding of the Union, but also her spiritual definition of union, her logo — UNIR1 — the unification of consciousness — You and I are One. This entry was posted on Friday, September 10th, 2010 at 11:50 am	and is filed under POLITICAL DIARY. You can follow any responses to this entry through the RSS 2.0 feed. You can leave a response, or trackback from your own site.